Two McEwan reviews in the space of a week. This one is a little more complimentary than my review of The Children Act. As soon as I began reading this book, I knew it was going to be the sort of story I enjoy. It's written in the first person narrative from the point of view of Serena Frome, a young Maths graduate from Cambridge university whose illicit relationship with a don leads her to to recruited by MI5. She is enrolled on a mission - Operation Sweet Tooth - to recruit talented new writers who might counter the leftist commentators of the 1970s. When she meets her charge, the promising short fiction writer, Tom Haley, the two begin a love affair and Serena is caught in a situation in which she cannot be honest with Tom without destroying their relationship. 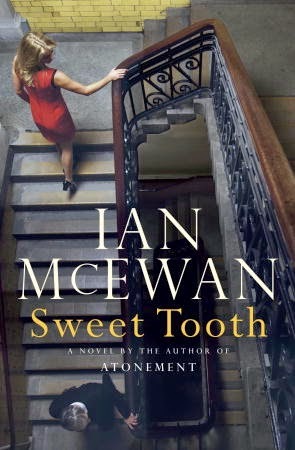 McEwan weaves a story of intrigue and hidden secrets from the point of view of a passionate and slightly naive protagonist. However, as you reach the end of the book, there is a startling revelation which makes you reconsider the entire story. I have the sense that this major plot twist may be divisive due to its implications for the female narrator, though I think it was a clever and interesting way to finish the book.